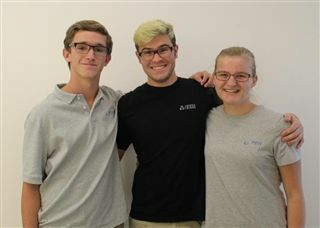 Congratulations to sophomore Rachael Bell, junior Jared Pollard and senior Liam Spooner on being selected to perform in the 2016 High School Honors Performance Series at Carnegie Hall. Rachael and Liam will perform with the Honors Concert Choir, while Jared will play french horn with the Honors Symphony Orchestra. The 750 finalists, chosen from 18,000 nominations, represent the most elite high school performers from around the world. During the 5-day program in early February, students will rehearse and perform under master conductors in one of the nation's most storied venues, and representatives from collegiate and professional music programs will be in attendance and on the lookout for prospective talent.